An interesting sleeve advertising the merits of the latest HMV 102. As the illustration shows the first version of this model. I reckon the sleeve must be circa 1931. Really interesting, really glad you posted this. Interesting to see how HMV sold the merits of the No 16 sound box and automatic brake which work fine on my 102 but the consensus is that they were less than desirable. I think I remember I also have something similar - a private shop sponsored sleeve with some "hints" from Brunswick. I hope I will remember to take a picture of it. In my opinion the 16 soundbox is not recommendable only in today's perspective, as it is a no-maintenance sealed soundbox. After 100 years almost, it is quite obvious that some maintenance would be needed. But at its time, when it was new, I think it was a good soundbox. What I really don't get is the comment about the automatic brake. Perhaps some people is clueless about how it should be adjusted, or unable to do it properly. I'm not fond in general of automatic brakes as I consider them an unnecessary gadget, however in my opinion the auto brake of the 102 is one of the best ever made if not "the" best. I have yet to find a record with which it fails. The automatic brake shown on the sleeve is the first type, only fitted for a short time, as HMV found them unreliable, having had many complaints from customers. I have three machines fitted with these, and I have to say I agree that they are very temperamental. I know how to adjust them, but even so, they have to be re-adjusted on a regular basis. The later No.6, fitted to all 102s until the end of production, are a vast improvement. Is there any real period documentation about the first type brake considered "unreliable" by customers when it was new? I am quite persuaded that it's just recent collector's speculation. I doubt that there is any "period" documentation regarding the unreliability of any product. Why would there be? My source of information is in Dave Coopers' excellent book "His Masters' Voice", the perfect portable gramophone". My personal view is that considering how short a time this brake was in production, I can see no reason for changing it to the No.6, other than the fact that it was, in fact, unreliable. Yes indeed, there should be many negative period reviews and articles on specialised magazines of the time, should the automatic stop worked so awfully when new. How does mr. Cooper substantiate this claim? If he doesn't, I would take for granted that it's just part of his to-day speculation. It is quite easy to explain why the first auto-stop mechanism was replaced with the second without implying that the first didn't work, just by looking at the two of them. The second is made with ⅓ or perhaps ¼ or less parts than the first, and it also has less moving parts like the rotary "heart" cam with its gearing etc, which by the way is quite complicated to manufacture. As a result, the second type is much cheaper to produce, and requires much less workmanship and assembly time. It is more *profitable*, in a word. And as it happens with all new things, it could also be advertised as a "new improved type" and sold for more even though it was cheaper to manufacture and costed less and was by no means any better, which is one of those typical operations that marketing experts are paid for. Presumably, the author of this book, who, incidentally, has more knowledge and experience than you or I, has a basis for his information, and is not relying on speculation. If we are going to start questioning the authenticity of information given by authors on a subject, I fear we are on a slippery slope! So, in conclusion, I have to say that Mr. Coopers' information, together with my own past experiences of these brakes over many years, is enough to convince me, at least, that they are unreliable. You must make up your own mind! So unreliable that some exasperated owners removed the entire mechanism and substituted a simple manual brake. Let's see. This is not easy to explain, but I will try it anyway. I don't know the mechanics of the early style of auto stop, as I've never seen one. But i know the latter style very well, and I can say that its design is bound to succeed, as it is a failsafe design. It's value resides in the very simple idea on which it is based. When designing any device, there are many possible solutions, but some of them will be based on simple ideas that will work, while others don't. The idea behind the second version of the 102 brake is so simple, and has so good characteristics that it is designed to work. So simple it is. The idea behind the design stands on the protruding finger under the turntable (the actual brake) and the movable arm under the U bracket, which goes along with the tonearm as soon as this touches the inner part of the U bracket. If you examine its simple operation, you will understand it immediately, and it is so a simple idea that it could not fail. 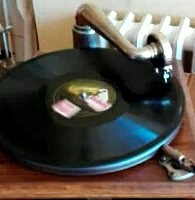 The finger under the turntable is part of a special ring designed to stop the turntable by friction if it is retained from its circular movement, carried by the turntable collar. As soon as the tonearm pushes the inner part of the U bracket, carried by the slow inner movement of the needle, the brake arm starts accompanying the tonearm movement thanks to the friction washer between them. So when approaching the center of the record, the brake arm also moves slowly towards the spindle. At a given point it touches the stopping finger, but only by a fraction of a millimeter. The finger has a curved end that pushes the arm out of its way. This is repeated at each record revolution, so the brake does not act. When the record ends, and there is a fast end groove that moves the needle towards the center, the tonearm and the brake arm go towards the center much faster, so at the next turn, the finger finds the brake arm frankly in front of it, and it is then retained by the brake arm, so the friction ring comes into action and stops the turntable rotation. Of course, this brake must never see any oil, of it would not work. The only records with which this brake does not work are those very old records that do not have such fast groove at the end. Besides that, the friction action exerted at the turntable collar is much more gentle than a sudden friction action on the turntable rim, as other auto brakes do. This is better for the motor governor.